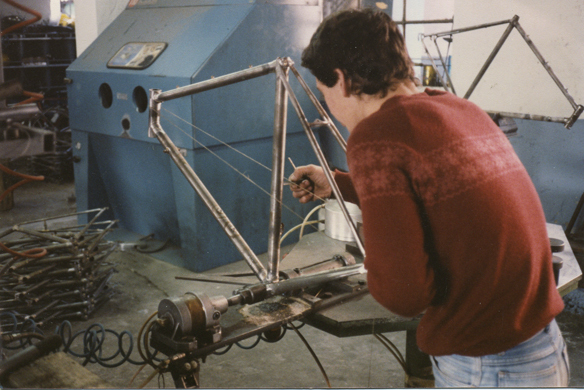 One of the joys of my career distributing high performance bikes and parts was being the distributor of Faggin frames. 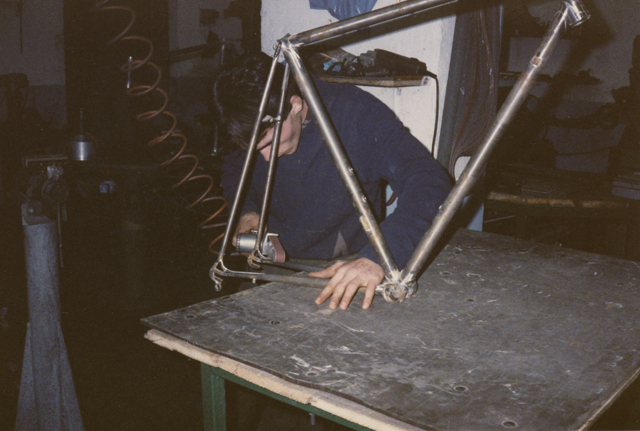 They were made in the shop next to the Faggin home in Padova (in English, Padua), Italy. It was pure good fortune that I met the Faggins. The Italian Trade Commission held an expo in Los Angeles in the early 1980s. I can't tell you the exact year, but perhaps 1980 or 1981. 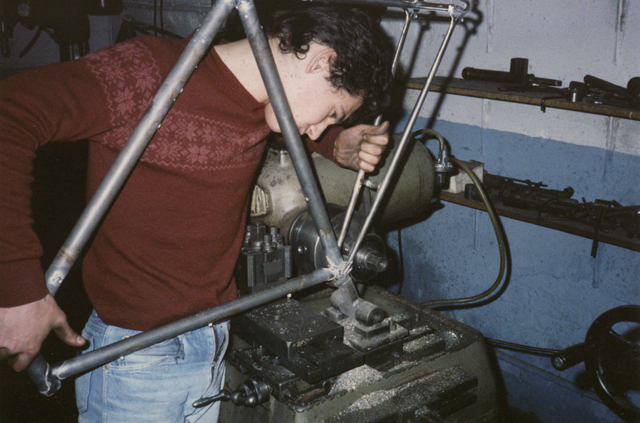 At the time we were importing a few items from Europe, including frames made in the old MKM shop in Harrogate, England. 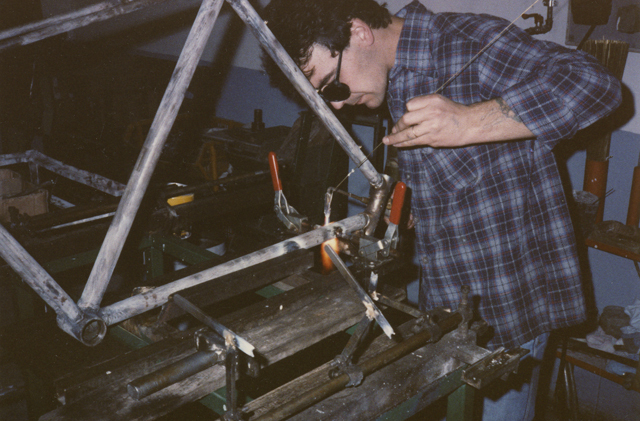 The shop closed in 1979 and we then had frames made by Steven Ellsworth, the MKM shop's truly gifted builder. We were looking for an Italian frame to import and arrived in the final hours of the Italian expo. There, in one of the booths, was Marcello Faggin and his daughter Cristina. Marcello was a former racer and his cousin Leandro was both an Olympic (Melbourne 1956) gold medalist as well as multiple world track champion in the individual pursuit. This family breathed bicycles. 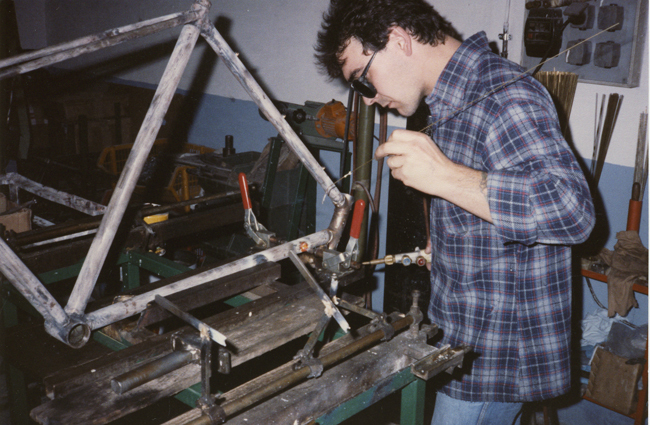 Marcello had started his framebuilding business in the Italian city of Udine in 1945 and later moved to Padova. I looked at the bikes and frames and saw the price list. I could not believe what I was seeing. From what I could see there in the exhibition hall, the frames were well-constructed, and like many frames from the Veneto region (the area around Venice), they were very well priced. After talking with the Faggins through an interpreter, Marcello told us to just take the frames with us and if we liked them, to send him an order. We found the trust Marcello put in us to be a wonderfully good sign. Trustworthy people generally trust others. 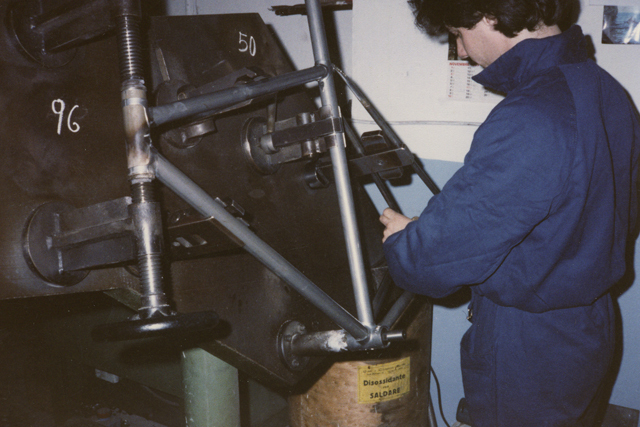 Upon returning to the shop, we put the the frames and bikes together and gave them some very serious test miles. They were a joy to ride, pure Italian stability and feel. We placed the order and a wonderful business was started. Eventually we were selling a thousand Faggin frames a year. 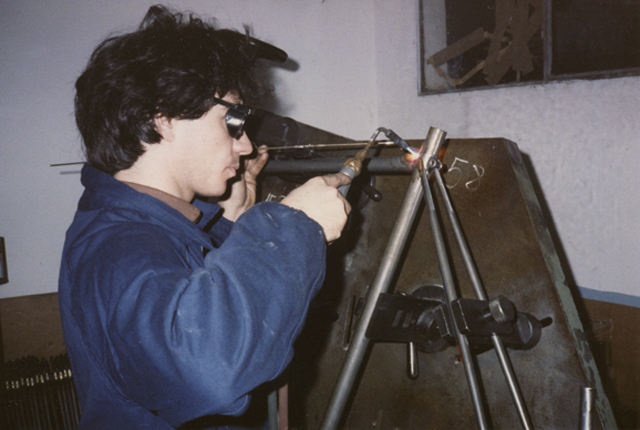 We traveled to the shop regularly and enjoyed every moment we spent with the Faggin family. 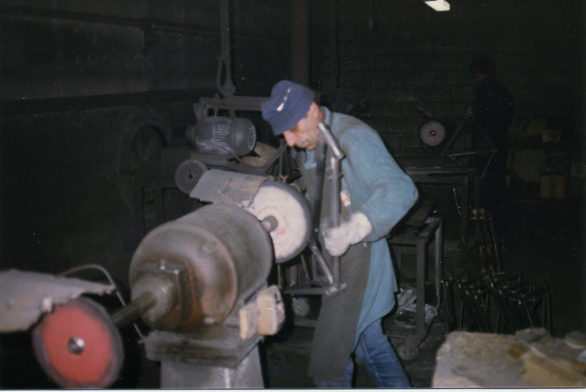 I recently discovered photos we took of the Faggin shop during a visit in the early 1980s. I hope you enjoy them. Oh, and here's the Faggin's website. 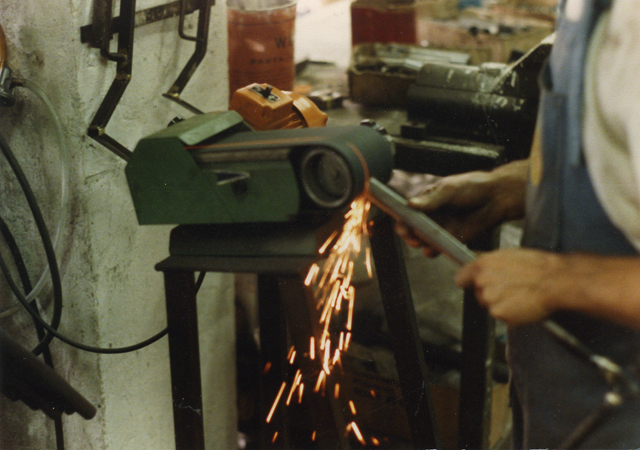 The Faggin family still makes frames in that same shop in Padova. 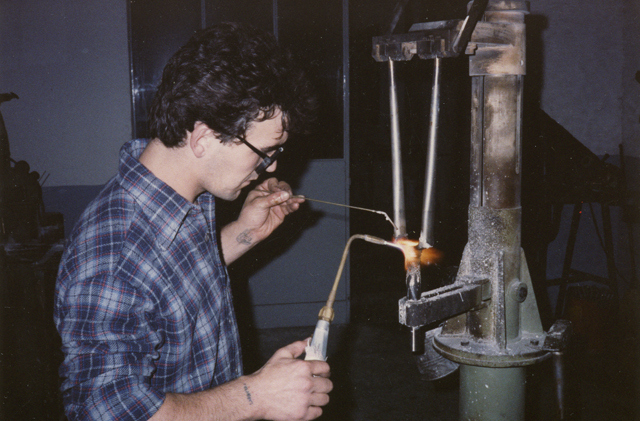 Brazing a fork. 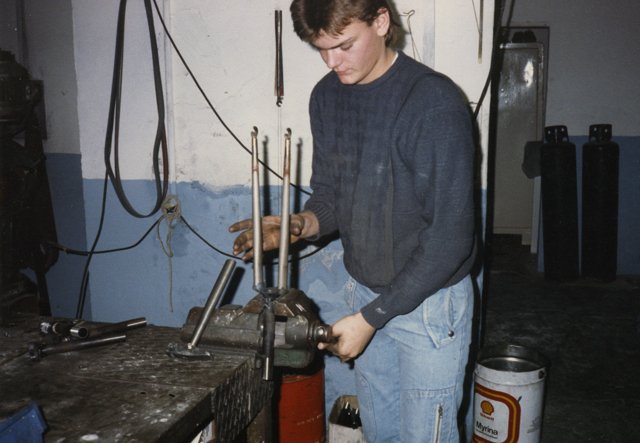 The blades are bent after brazing. 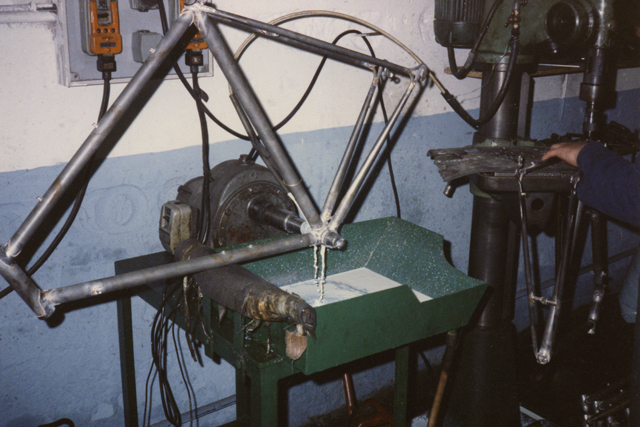 This looks like a rear triangle assembly being made ready for the jig. Partially built frame sub-assemblies are put together in the hand-set jig. Massimo works his magic with the torch. The braze-ons have to be fitted. 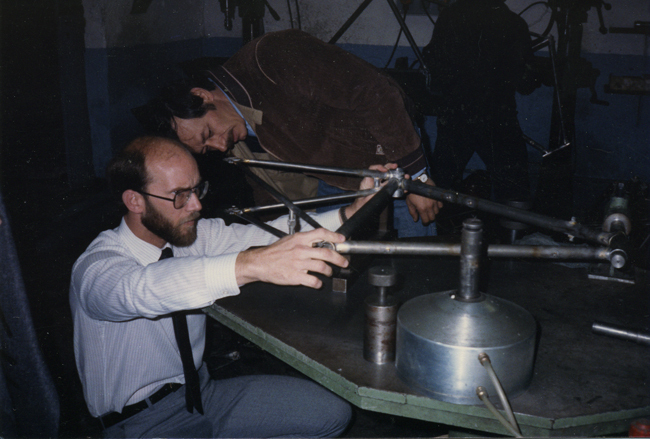 Another shot of the brazing. Note the special tooling to hold the downtube shifter bosses (remember downtube shifters?). The bottom bracket is tapped. 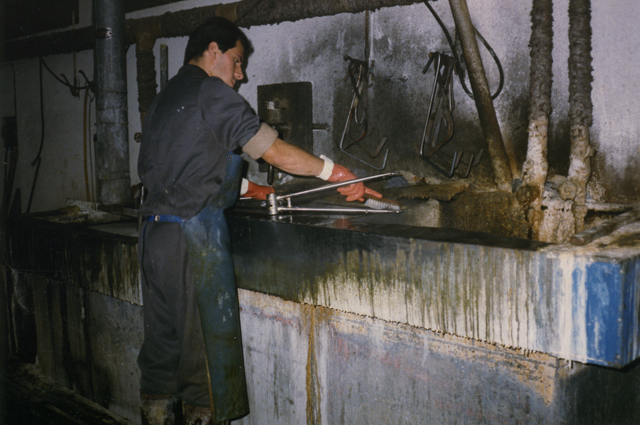 Note the continuous flow of cutting oil. Another hard, dirty job, shaping the dropout-tube junctions. Shop manager Giorgio is showing me the alignment table. And here's proof I used to dress like a grown-up. The frames are sent out to a chrome shop. And checked for alignment. You	can	see	the	frames	stacked,	awaiting	the	next	step.